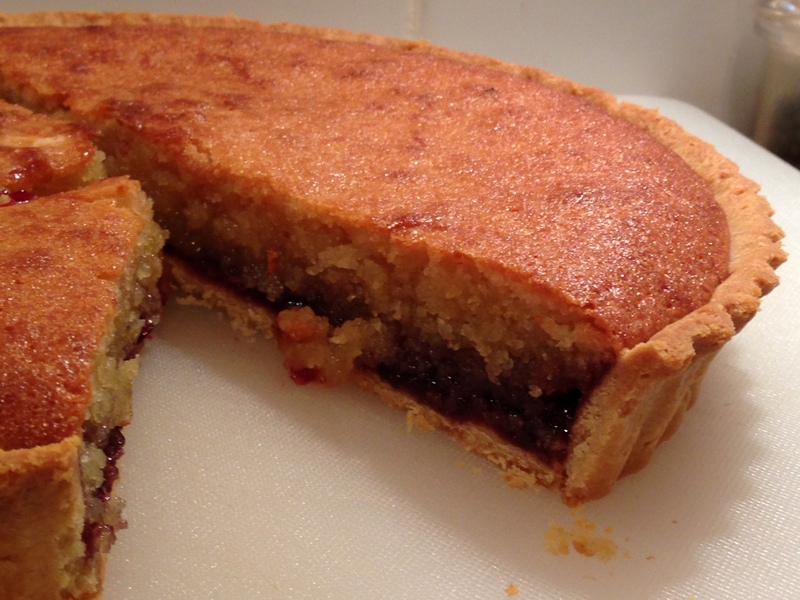 Bakewell tart, or Bakewell Pudding is a British classic. I’ve been wanting to cook one for ages, and planned to bake one whilst off on a week’s holiday at home with Alex – quality Dad/Daughter time. I did intend to base this on a home made Blackcurrant jam. I’ve a freezer full of blackcurrants and need to get through them. However the pot I pulled out contained a mixture of ‘summer fruits’ – blackberries, raspberries and blackcurrants. Not enough to do anything significant with, but just enough to make a nice little jam to cover the base of this wonderful pudding. This recipe uses a lot of jam – you don’t have to make your own, use shop bought if you wish. You can use as little as a couple of tablespoons, but I like plenty in mine! Top with sliced almonds, fruit, icing sugar or whatever you fancy, or just serve as it comes. Wonderful with fresh custard!